TV host Laura Ingraham made a series swipes directed at slain musician and community activist Nipsey Hussle during her Fox News show The Ingraham Angle on Friday night. Ingraham then played a clip the song, which became an anthem at protests during the 2016 presidential campaign and the rash protests that followed Trump’s inauguration. 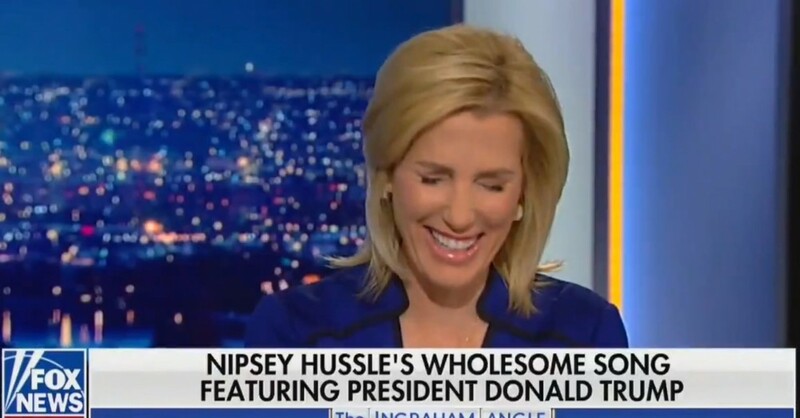 Ingraham focused on the song’s chorus, which repeatedly uses the phrase “f*ck Donald Trump.” As she spoke, the lower-third the screen featured a text chyron that read: “Nipsey Hussle’s Wholesome Song Featuring Donald Trump.” “Now that’s a very creative refrain!” Ingraham joked.